Crab apples are here when the eaters and cookers have mostly fallen from the trees. 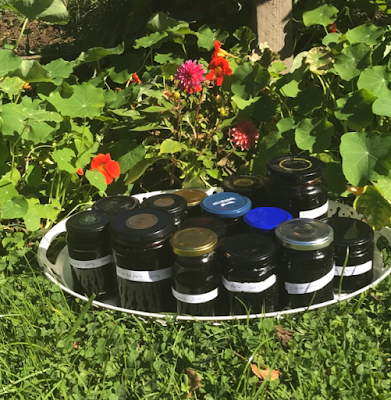 Here is my mother's recipe for crab apple jelly, excellent with our West Country cheeses along with my other chutneys. Put the crab apples (whole, not cut up) into a large pan. Add enough water to cover them. Bring to the boil, simmer and stir occasionally until they have become soft. Remove the mushy crab apples from the heat, once cooled enough to handle then pour into a piece of muslin in a colander and leave to strain overnight into a large bowl. If you are making a large quantity you can use a pillow case! Don’t be tempted to squeeze the bag or the jelly will be cloudy.Measure the strained juice and pour back into the saucepan / preserving pan and heat slowly. Use a ratio of 1 pound of sugar to 1 pint of juice. Stir on a low heat until the sugar dissolves and then bring to the boil.Boil rapidly until setting point is achieved (test by dropping a spoonful of mixture onto a fridge cold saucer, as it cools it should wrinkle on the surface). Pour hot jelly into hot sterile jars and seal immediately. Well, sadly it is nearing the end of Elderflower season. You can still find a few flower heads up on top of the Mendips and probably other hilltops around the country. They were really abundant this year - the best for a long time! I have spent many happy hours gathering them from the edge of fields and enjoying their scent once I have got them home and put them in the mix - not so sweet smelling on their own. I do count them into the bag or bucket I am carrying. You need forty for each batch. I am always generous with them as some are smaller than others. 3oz citric acid - best place to buy this is ebay. Mix everything together, stir really well to make sure the sugar has dissolved properly and leave to steep for two or three days. Squeeze as much out with your hands as you can. Then use a sieve to collect as many of the little flowers left in as possible. Using a jug, place your sieve over a bucket or container, line the sieve with a tea towel, and pour the liquid through. Sometimes you need to squeeze the tea towel a bit to push it through. Bottle and keep some in the fridge. Freeze the rest. Add to salad dressings - mix with a good quality white wine vinegar, some decent olive oil, salt and pepper and whisk. Delicious! Make a jelly with elderflower mixed with sparkling water - you can add prosecco or other sparkling wine. For every pint of liquid, add four sheets of soaked gelatine. Pour into a glass bowl or terrine tin, with fresh fruit. If using a terrine tin you can slice it and serve plated with more berries and whipped cream. Add to whipped cream and serve with fruit puddings. Use in cocktails. Very good with prosecco! Spring has now really sprung, which means a number of things. The sun starts pretending to be warm and watery skies are blue(er) sometimes. The last of the snowdrops have gone back to bed for another year, and bluebells and wild garlic flowers don the woods looking fabulous with their gorgeous pungent scents. The hedgerows are filling up with bigger, bolder, wilder greenery. this morning getting ready for our piglets arriving on Sunday. Can't wait - they are always so sweet when they first arrive. I have a good recipe for nettle risotto - for those who don't know, they don't sting once wilted down! Make sure you only use the less mature tips and use gloves to pick them with. 700ml stock - can be vegetable or chicken. Heated until almost boiling. In a good sized saucepan, gently fry the onion in the oil until it starts to soften, add the celery if using for a couple of minutes. Pour in the risotto rice and stir to coat the grains in oil. Add the sliced leek and bayleaf. Then add the white wine or lemon juice, the bay leaf, the small amount of chilli flakes and salt and pepper. Add a ladle full of hot stock, and stir. Keep adding stock a little at a time until the rice is al dente. Stir in the nettle tops, wild garlic and mint, and add more stock if necessary. Adjust seasoning, and make sure rice is cooked. Stir in a little grated parmesan and serve. Top with the rest of the cheese. Lots of lovely things are coming up in the hedgerows at the moment, although you might not always know what can be eaten. There are also edible flowers such as primroses, celandines and violets. To the right is a small photo of a cleaver - some people call it goose grass. It is that stuff that sticks to you and has little seed bobbles on it later in the year. At the moment, the tips are delicious and very good as a garnish for both starter and main courses, mixed with a little good quality olive oil. They can also be put in soups and liquidized. They taste a little like slightly grassy cucumber. 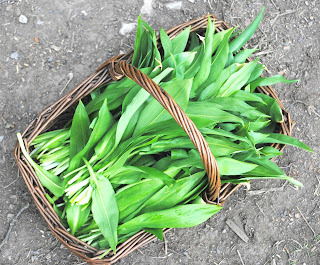 Wild garlic is something else that is just popping up all over the place. 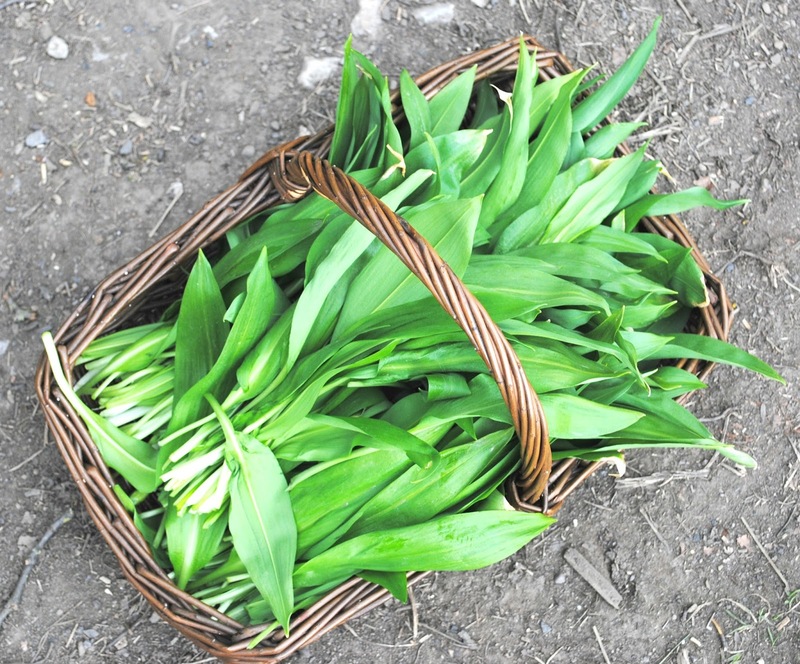 It is best picked before it comes into flower - although the flowers themselves are excellent as garnish. I put it in risottos and soups. It is also excellent as a pesto. The thing that I have only just discovered growing at this time of year are Elf Caps. They grow on dead wood in the forest and I never knew one could eat them until I went to The Ethicurean and had them there. I looked them up on youtube and then managed to find lots when I went hunting on my horse last week in the woods. They usually have moss sticking to the back of them which needs to be removed - you can do this with an old toothbrush. I pickled mine in an old jar of gherkins - the vinegar is not too strong and has a little tarragon and sweetness about it. You can eat them raw like this, or cook them and serve them as a beautiful garnish to venison or lamb or indeed anything else. As I rode through Stourhead woods on my beautiful chestnut horse the other day, I fell to wondering what was still edible at this time of year apart from the inevitable game....I then looked down and amongst the moss noticed that there was loads of wood sorrel. 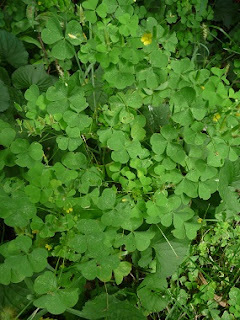 This is an interesting little plant - it looks a little like clover and not at all like the domestic sorrel that grows in the garden. It does however have the same delicious lemony taste and is very good used in winter salads and as garnish on fish and also on canapes. Like many small bracket fungi, this tends to be dismissed as uninteresting and rubbery in many books. But to write it off as a waste of time is unfair because it has a good flavour and better still it is available almost all round the year. This recipe sidesteps the texture problem by shredding the mushroom finely. It also works particularly well in stir fries (a close relative is a common ingredient in Chinese cooking), although in this case the inspiration came from Italy rather than the Far East. The other way I like to serve Jew's Ears is by drying them out in the Aga and then crumbling them up and adding them to Soups and stews. They have become a side product of the Elder Bushes now grown commercially for Elderflower cordial, and you will find auricula-judae, listed in the Wild Mushroom Cuppa soup ingredients. So...that's the end of my wild food January post. Having cooked for the performers at Glastonbury Festival for many years, I thought I'd seen it all backstage, it seems I am wrong, the baddest boy of them all is.... Father Christmas. Camera fades to long ago way back when the Koryak shaman (nomadic reindeer herders) from Russia's Far East collected Amanita Muscaria or Fly Agaric, the red and white spotted toxic and hallucinogenic mushrooms under the pine trees and dried them out for a spot of interesting Winter Solstice leisure activity. 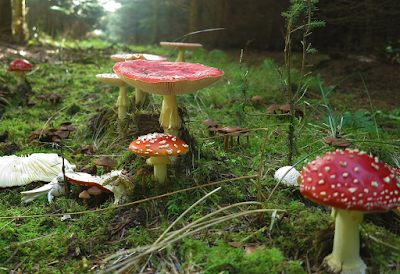 Once dried, they would feed the fly agaric to the reindeer, immune to the poisonous side effects who pee'd out the residue which would be drunk by the shaman transporting them into a trance like state. The reindeer joined in too by eating the snow where the tripping shaman had peed. Everyone was flying! Where were the presents? Naturally the 'Father Christmas' shamans were drawn to wearing red and white outfits while out on their pursuit of fly agaric, arriving home (arctic yurts) they climbed through the chimney opening in the roof, the front door being snowed in. Once down in the hearth (with the soles of their reindeer boots blackened with smoke) they would open their sack of reindeer urine and settle in for a festive trip with their neighbours. Toss diced venison in flour. Add the venison to the pan and fry with onion and celery (if the pan is large enough). If the pan is too small then do it separately. Add salt & pepper, all spice, chilli and thyme. Add wine, port, orange zest and juice (you may need a little stock to top it up). Place in oven at 180 degrees for at least an hour, depending on how tender the venison is, it might take longer.